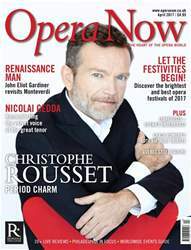 Write to Opera Now, 20 Rugby Street, London, WC1N 3QZ, email opera.now@rhinegold.co.uk or tweet @Operanow. Star letters will receive a free DVD from Opus Arte’s extensive catalogue of world-class opera productions. Having read so many negative reports of English National Opera in the press over the past couple of years, I was in two minds as to whether I should accept an invitation to go to their recent production of Partenope. Apart from anything else, this was the first time I’d ever been to a staged Handel opera, and I was concerned that this would be an inauspicious introduction. I needn’t have worried. I had a thoroughly enjoyable evening at the opera – as good as anything I’ve experienced on the international scene. Christopher Alden’s production was clever and stylish, with the updating to 1920s West Coast America entirely appropriate for a story with glamour, flirting and brittle wit at its heart. I should also add that while the Coliseum is often cited as a ‘problem theatre’ for singers, in this case I could hear every word sung by an excellent cast. I usually play safe with opera and go to the Royal Opera House, but on this evidence, I’ll be heading to ENO much more often.